It's time for Sparkle n Sprinkle's Spring Fling blog hop and I have been busy little bee!! If you stopped by from Charlene's Paper and Ink Playground then you are hopping down the bunny trail in order. If you would like to start from the beginning then head back to the Sparkle N Sprinkle blog to see how to get entered in for FIVE fun prizes. 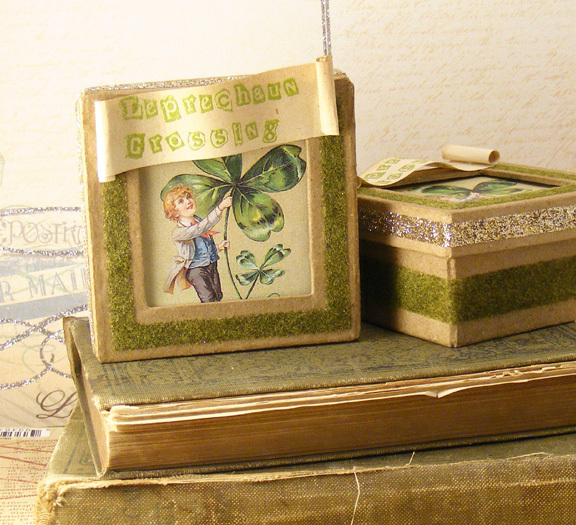 I created two projects to share to the 'Luck of the Irish' this St Patrick's Day, the first is a vintage style paper mache box. One of my favorite tips for creating an object that looks vintage is to use flocking. Lucky for me Sparkle N Sprinkle has such a great selection of colors to choose from. It was super simple to create the look I was after on this box with 1/2" Tear-ific Tape. It created perfect straight lines and is super sticky so the flocking is sure to stay put. The image I used is reprinted from a vintage St Patrick's day greeting card, just do a Google search and you are sure to come with some great choices to save and use for your future projects. Now, because I don't want you to get pinched...I wanted to share these looped barrettes. 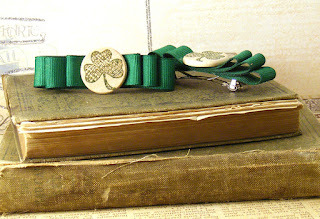 They are a perfect way to be wear'n the green this St Patrick's Day, they even have a little glitter sparkle in the embossed clover...perfect to catch the wandering eye of leprechaun. If you catch him you can try to get his pot of gold. It is time to hop on down the blog path to the next destination, but before you go be sure to leave a comment... you never know which designer's blog will have goodies to giveaway. Angie, you are so amazing! The way you use products and images altered into wonderful pieces of home and personal decor always piques my imagination! Thanks for inspirational projects! Love your projects. You did a wonderful job! Your projects are gorgeous! You are so creative! I'm not Irish, but I sure do like these. You go girl! That leprecaun is just too stinkin' cute................really just too cute. What a great idea to use flocking on the outside of the box as a decorative element - I've always used it on the inside! The barrettes are just so much fun. Fabulous projects! I love the hair bows and the box is just super! Angie you are so darn creative! I love visiting your blog, something inspiring every time I come! Thanks for the great ideas for St. Patrick's Day. Another set of cards I need to make for the shut-ins as well. My work is cut out for me I think and I need all the help I can get. Thank you for telling me how to adhere flocking. Seeing baretts reminded me of my youth when I used to make baretts. Love both of your projects, and the idea of using the flocking is perfect! Such a nice, soft touch on the boxes. Thanks so much for sharing with us. Your flocking and colors are great!!! I like the barrette idea to wear our green! That's a quick and cute way to keep the tradition without changing the wardrobe. Thanks for sharing your ideas. Both of your projects are adorable. Angie, What great projects. Those barrettes will look great in a sweet little girls hair and that box is so beautiful! These are so pretty...love the vintage look of the card and those sweet barrettes are unique! Love the box! If you're not Irish, it could make you think about changing. Thank you for sharing. So creative, Angie! Love the box - would make such a cute gift and the barrettes are adorable! Could have used one when I was teaching! Just adore those creative boxes. and both designs are lovely pieces of altered art. Well done you. Love how you're always coming up with novel ideas to use the SNS products! LOVE the box - and the barrettes are too cute! Great Job, I love the barrettes! Both of your projects are just gorgeous. Loving the glitter tape on that box! Very cute projects and thanks for the flocking hints. Thanks for sharing. Love your vintage St. Patrick's day look! love the barrettes! Am going to make them for our 2 granmddaughters. Thanks for sharing your ideas. Also love the quote @ the top of your blog. Very cool. That flocking is just the ticket to make your box really special. I espicially liked the vintage look of the box! Love both projects! Great job! Thanks for the vintage look info on the flocking. I've just started to dabble with it and I'm still not too sure on what to use it with. Your paper mache box is really unique & lovely. The image you chose is perfect. We all need to be Irish with these wonderful ideas..............the box is beautiful and the hair clips are so simple and stricking! These boxes are so awesome! I love how you did the sentiment on a scroll! The barrettes are very pretty too! Great job! Two very nice projects! Love the flocking on the box and all those loops on the barrette. Fabulous projects. Love the bows, too. I love the bows you made. The box is awesome and how you rolled the banner above the image. Great creations! Angie, what great projects. Great use of the flocking and glitters. Adorable Angie! LOVE the look of the flocking on the box and the rolled banners too. And the barrettes - what a great idea! Such great inspirations! These are all so pretty and on display at the store:) Thanks for the great items to show off! These are amazing! 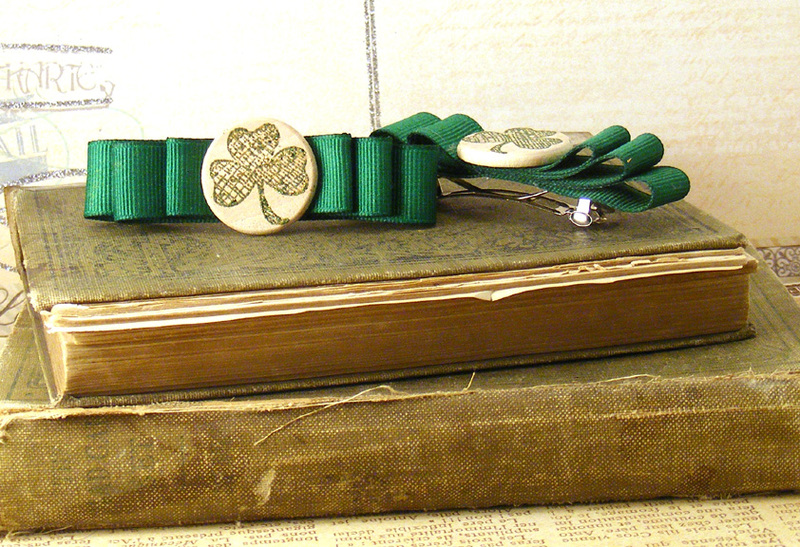 I love the way the ribbon is folded and then topped with the shamrock.